Recurrent GBM (RGBM) has a highly unfavorable prognosis with majority of patients dying within 6 months and no standard treatments available. Antineoplaston (ANP) A10 and AS2-1 injections underwent Phase II trials in RGBM patients, which reported a long-term overall survival (OS) in a small percentage of patients. The additional Phase II studies BT-07, and BT-21 with ANP in GBM also revealed cases of a long-term OS. ANP shares active ingredients with metabolites of sodium phenylbutyrate (PB), which was used in private practice setting in combination of targeted and chemotherapeutic agents for the treatment of RGBM. The treatment contributed to cases of rapid complete response (CR) and significant OS. This paper provides case studies of three patients treated with ANP under Phase II protocols and two patients treated with PB in combination with targeted therapy, who obtained CR and long-term OS. Based on these studies and basic research on the effects of ANP and PB on the genome of GBM and review of results of preclinical and clinical research on targeted agents, the authors suggest a new strategy for successful treatment of RGBM. They propose Phase I/II clinical trials with ANP and PB in combination with targeted agents, bevacizumab (BVZ), pazopanib, dasatinib and everolimus in patients with RGBM after failure of standard surgery, radiation therapy (RT) and chemotherapy including temozolomide (TMZ) to be conducted to evaluate survival, response and toxicity in these patients. Glioblastoma multiforme (GBM; World Health Organization [WHO] grade IV) represents the most frequent occurring and is among the most aggressive form of primary malignant brain tumors, accounting for 54% of the gliomas  - . Despite surgery, radiation therapy (RT), and adjuvant temozolomide (TMZ) and bevacizumab (BVZ), the prognosis of patients with GBM has been extremely poor, with a median survival of 14.6 months from diagnosis  . According to data from clinical trials, the 5-year survival rates are between 1% and 2% for patients with newly-diagnosed GBM although higher rates have been reported   . The median progression-free-survival (PFS) after standard therapy is 6 - 9 months, proving that the current treatment options are palliative and not curative  . The results are much worse in recurrent GBM (RGBM) with majority of patients dying within six months. In view of the unfavorable survival outlook with currently available treatment modalities, it is important to evaluate new agents for treatment of GBM. Antineoplastons (ANP) are peptides, amino acid derivatives and carboxylic acids which were initially isolated from blood and urine of healthy subjects  . Since ANP were found deficient in blood of cancer patients, it was postulated that they may have anticancer activity  . Antineoplastic activity of these compounds has been proven in a number of preclinical and clinical studies  - . Phase I studies were conducted with formulations consisting of substances isolated from normal human urine and from synthetic derivatives   . Recently completed Phase II clinical trials at the Burzynski Clinic (BC) confirmed anticancer activity of ANP in various primary brain tumors and colorectal cancer with liver metastases  - . Phase II trials were conducted on synthetic analogs of fractions derived from urine, which were formulated into ANP A10 and AS2-1 injections. This program has been recently completed and the final reports are published or in preparation for submission to the journals     . Study BT-21 evaluated safety and efficacy of ANP A10 and AS2-1 in recurrent high-grade glioma with special attention to RGBM. In the RGBM population of 30 patients, only 24 patients received over 28 days of ANP treatment. This group was named eligible RGBM (ERGBM). The responses and survival data were presented for both groups separately. In RGBM population, objective responses (OR) were determined in 13% of patients, overall survival (OS) was 55.5% at 6 months; 48.5% at 9 months, 34.7% at 1 year, and 3.5% at 2, 5 in 10 years, which compared favorably to other clinical trials  . In ERGBM population, objective responses (OR) were determined in 17% of eligible patients, overall survival (OS) was 65.5% at 6 months; 56.7% at 9 months, 39% at 1 year, and 4.4% at 2, 5 in 10 years  . The results indicated that OS at 6 and 9 months is sufficiently high enough to warrant further study. It is important to note that one of the patients continues to survive after the initial ANP treatment over 12 years and is healthy. It should be noted that this patient relapsed after two and half years of CR after ANP and underwent additional treatments, and his tumor type transformed to primitive neuroectodermal tumor (PNET). The additional Phase II studies with ANP A10 and AS2-1 in GBM patients were conducted at BC according to Protocol BT-07 and BT-20. BT-07 accrued GBM patients without prior RT and chemotherapy; and BT-20 subjects with RGBM (final reports in preparation). We identified a small group of patients treated by these protocols, who have unusually long overall survival (OS) ranging from 9 to over 18 years. Though molecular profiling was not yet available at the time when these patients initiated ANP therapy, at time of diagnosis they had aggressive GBM with estimated short OS. The availability of molecular profiling in recent years and the data from the study of the effect of ingredients of ANP, phenylacetylglutaminate (PG) and phenylacetate (PN) on the GBM genome may explain why only a small population of GBM patients in ANP trials had long-term survivals  - . GBM has a complex network of hundreds of abnormal genes  . PG and PN effect approximately 100 genes in GBM genome, but this spectrum of activity may only permit control of some patients  . Thus, it is conceivable that amajority of GBM patients will have important abnormal genes outside ANP spectrum and will not respond. In 2012, a GBM classification into six biological subgroups had been proposed  . Each of the proposed subgroups has distinct molecular and biological characteristics. It is understood that this is only the beginning of a process of more accurate classification of GBM, but the studies confirm that one GBM patient could be completely different than another and would require a different treatment plan. Studies on sodium phenylbutyrate (PB) at John Hopkins Medical School about 25 years ago revealed that PB is metabolized to PG and PN  PB, a prescription drug approved for urea cycle disorders, is also indicated for the treatment of glioma and acute promyelocytic leukemia. The Phase I study and additional published data revealed activity against high-grade glioma   . Though PB is a prescription drug in the USA, it is sometimes used off-label for the treatment of gliomas for which no standard curative treatment modalities are available. PB is a histone deacetylase (HDAC) inhibitor. It has a similar spectrum of activity as ANP A10 and AS2-1 due to the metabolites PG and PN. However, its activity may not be as potent, since it is administered orally. Dosing of PB is recommended not exceed 0.4 g/kg/day, whereas the highest dose of ANP A10 used in clinical trials is 20 g/kg/day, some 50 times higher due to intravenous administration. The concentration in plasma of PG and PN derived from the metabolism of PB is considerably lower compared to the administration of ANP. It is expected that the number of genes affected by PB as compared to ANP is substantially lower. On the other hand, PB produces neoplastic growth inhibition through several additional mechanisms described in the Discussion section. RGBM patients (who were not candidates for Phase II studies of ANP) were treated in a personalized targeted therapy setting. The treatment plans of these patients were based on genomic profiling and consisted of PB for broad spectrum coverage and selected targeted agents indicated by molecular profiling. A number of objective responses were determined within the course of treatment. A long-term OS is considered highly unusual in RGBM. These findings prompted the design of open label genomics-driven study protocols for RGBM with combination of ANP A10 and AS2-1 plus targeted agents and PB plus targeted agents. These protocols are now being prepared for submission to regulatory agencies in different countries. This paper provides a brief description of five cases of RGBM with long-term survival; three of which were treated with ANP A10 and AS2-1 and two with PB in combination with targeted agents. The discussion includes a mini review of recent studies of targeted therapies in GBM and outlines the rationale for proposed clinical trials with a combination of ANP, PB and targeted agents. Three patients (cases 1 - 3) were accrued into Phase II studies with ANP A10 and AS-1 between November 1995 and September 2004. Two additional patients (cases 4 and 5) were treated with PB and targeted agents in private practice at BC (admitted between April 2012 and February 2013). Patient 1 was treated under special exception to protocol BT-20, and Patient 2 under special exception to Protocol BT-21. Patient 3 was admitted to study BT-07. These studies were conducted in accordance with the US Code of Federal Regulations, Title 21, Parts 11, 50, 56, and 312; the Declaration of Helsinki (1964) including all amendments and revisions; the Good Clinical Practices: Consolidated Guideline (E6); International Conference on Harmonization; and the FDA’s Guidance for Industry. The studies were sponsored by the Burzynski Research Institute (BRI) and conducted by the BC. The studies shared the same design of the single-arm, two-stage, Phase II trials. The patients described in case presentation 4 and 5 received treatment in private practice. All patients read, understood, and signed the informed consent prior to admission, which explained in detail the treatment and the medications. Histologic diagnoses and responses to treatment were evaluated and confirmed by outside pathologists and radiologists. A 45-year-old Caucasian female was in good health until the previous year and presented to BC with a several-month history of frequent headaches followed by left-sided weakness. These symptoms were severe enough to warrant a visit to an outside emergency room. Magnetic resonance imaging (MRI) of the head revealed a tumor in the temporoparietal region on the right side of the brain (Table 1). In May 1997, she underwent a gross surgical resection of the tumor revealing a pathologic diagnosis of GBM. The patient then received RT at a dose of 5940 cGy over a 6-week duration. After 4 months, she underwent a Gamma Knife procedure. MRI performed after 4 months revealed no change in the tumor, but a subsequent follow-up MRI after 3 months showed a recurrent enhancing lesion, which was confirmed by a positron emission tomography (PET). After recurrence, the patient underwent right temporal lobectomy at a University Hospital. The pathology examination confirmed GBM. MRI performed within one month revealed a measurable recurrent nodule. The patient was advised to consider a third surgery, but she refused. A month later (August 1998), treatment with intravenous (IV) infusions of ANP A10 and AS2-1 was initiated at the BC, based on special exception to Protocol BT-20  . During the baseline evaluation, the patient complained of marked weakness, short-term memory loss, frequent auras, and loss of coordination, nausea and dizziness. She had difficulty walking without assistance and had a significant speech problem. Table 1. Characteristics of patients enrolled in antineoplastons trials. Abbreviations: ANP—antineoplastons; CRR—central radiology review; CR—complete response; F—female; GBM—glioblastoma multiforme; MRI— magnetic resonance imaging; M—male; OS—overall survival; PR—partial response; PFS—progression-free survival; PD—progressive disease; RT—radiation therapy; TMZ—temozolomide; *Special Exception; **PR on antineoplastons; CR after second resection. BT-07, BT-20 and BT-21 studies accrued 40 patients each; ***PFS calculated from the date of the 2nd tumor resection. Physical examination revealed blurred margins of both optic discs. Her Karnofsky Performance Status (KPS) score was 50. The ANP treatment was started at the dosage of 1.23 g/kg/day of IV A10 and 0.15 g/kg/day of AS2-1. Dosage of A10 and AS2-1 was gradually increased, according to protocol, to 10.48 g/kg/day and 0.17 g/kg/day, respectively. ANP was discontinued after 18.5 months due to CR. The only adverse drug experiences (ADE) possibly related to treatment was grade 1 skin rash, which resolved spontaneously, and grade 1 hypernatremia. The adverse events for all three cases were graded according to the Common Terminology Criteria for Adverse Events Version 3.0 (CTCAE v.3). After stopping treatment with IV ANP, the patient was converted to capsules of ANP A10 and AS2-1 (0.5 g), initially 0.05 g/kg/day of both. The dosage of both A10 and AS2-1 was gradually increased to 0.14 g/kg/day. All therapy was discontinued after 31 months from treatment start. During the course of treatment, the patient made substantial recovery. At 9 months into the treatment with IV ANP, she was able to walk with the help of a walker and made progress in her speech therapy. She continued to have further improvement, as indicted by her scheduled physical examinations. Her KPS increased to 80. During her examination at 4 years after treatment completion, she was able to walk with a cane. Her baseline MRI revealed a right temporal enhancing nodule measuring 1.3 × 1.2 cm. There was continuous improvement on follow-up MRIs. Beginning 4 months after start of ANP, MRI images showed a CR. Follow-up MRIs, repeated every 8 weeks to 3 months, with the latest one performed in October 2013, did not show any recurrent tumor (Figure 1). A 59-year-old Caucasian male, retired US Marine Corp lieutenant colonel, presented in March 2004 to an outside clinic, with severe headaches and diminished coordination. MRI of the head demonstrated a contrast enhancing lesion in the left frontal lobe. Subsequently, in April 2004, he underwent near-total tumor resection (Table 1). The pathologic diagnosis was GBM. A month after the first surgery, he underwent a second resection of the tumor and GLIADEL® wafer placement. Subsequently, he received RT at a total dose of 6000 cGy in 30 sessions. He also received three cycles of TMZ concomitantly. Following the standard RT and TMZ, he was treated with isotretinoin. At this point, brain MRI and MR spectroscopy revealed a lesion within the left insular cortex which nearly doubled in size. After the failure of standard therapy, the patient was admitted to BC for treatment with ANP based on special exception to Protocol BT-21  . During baseline evaluation, the patient complained of headaches, fatigue, bilateral tinnitus, bilateral blurred vision, expressive dysphasia, decreased activity, confusion, intermittent hesitancy, and short-term memory loss. His neurological examination was significant for slight expressive dysphasia and mild slurred speech. His KPS score was 50. The treatment was started with IV ANP at the dosage level of 0.69 g/kg/day of A10 and 0.15 g/kg/day of AS2-1 in September 2004. The dose of A10 was gradually increased to 10.5 g/kg/day and AS2-1 to 0.33 g/kg/day. The patient experienced intermittent grade 2 dysgeusia, likely related to ANP which resolved spontaneously. He experienced grade 3 fatigue, which resolved after dose reduction of ANP, and grade 2 somnolence, which resolved after AS2-1 was temporarily stopped. His baseline MRI before treatment revealed a left insular enhancing lesion measuring 3.0 × 2.5 cm. Baseline PET indicated high metabolic activity in the left lesion, representing malignant tumor. Follow-up MRIs performed approximately at 8-week intervals demonstrated continued decrease in tumor size. The PET after 4.5 months of treatment revealed resolution of the focus of high metabolic activity. The treatment with antineoplastons was discontinued after 7.5 months due to infection of the IV catheter and negative PET. MRI at approximately 1 year post-treatment showed a 60% decrease in tumor size (2.0 × 1.5 cm). There was continued decrease of tumor size until 3 years and 2.5 months when there was no visible tumor. Follow-up PET scan of the brain repeated after 3 months did not show any increased metabolic activity. Follow-up MRI at 4 years confirmed resolution of the tumor. MRIs of the head, repeated at 4 - 6 month intervals, did not reveal any tumor recurrence. The latest MRI of the head performed in February 2014 showed postoperative changes with no recurrent tumor (Figure 2). Figure 1. Patient 1. (A) Baseline MRI of the head with contrast; (B) Follow-up MRI of the head with contrast indicating complete response; (C) Follow-up MRI of the head with contrast indicating continuation of complete response. Figure 2. Patient 2. (A) Baseline MRI of the head with contrast; (B) Follow-up MRI of the head with contrast indicating complete response; (C) Follow-up MRI of the head with contrast indicating continuation of complete response. A 37-year-old Caucasian male and practicing attorney in September 1995 developed severe headaches and vomiting. He presented to the local emergency room, where he was found to have an abnormal CT. The MRI of the head revealed a tumor in the right frontal area of the brain (Table 1). He subsequently underwent right subtotal tumor resection. The diagnosis of GBM was confirmed by two experienced neuropathologists. A month later in November 1995, the patient was enrolled for treatment with ANP at BC according to Protocol BT-07 and began treatment per protocol  . At baseline, he complained of forgetfulness and personality changes. Neurological examination was grossly within normal limits and had a KPS score of 90. The dosage of ANP A10 and AS2-1 was gradually escalated from 1.13 g/kg/day and 0.25 g/kg/day to 10.7 g/kg/g and 0.33 g/kg/day, respectively. ANP was very well-tolerated, and no ADEs related to the treatment were reported. The treatment was discontinued after 9 months due to disease progression. Baseline MRI of the head performed before initiating ANP treatment revealed a contrast–enhancing mass in the right frontal lobe, measuring 4.0 × 2.0 cm. Follow-up MRIs at 1-month treatment revealed a partial response (PR, over 50% decrease) (3.3 × 1.2 cm). There was continuous further decrease in tumor size, as indicated by MRIs. The maximum decrease in tumor size was 88%. The patient became completely asymptomatic at this point, with a KPS score of 100. He was doing well on ANP until his follow-up MRI after 8 months of treatment showed a 28% increase in tumor size versus the baseline (Figure 3). Subsequently, the ANP therapy was discontinued, and the patient underwent total resection of the tumor. Postoperative pathologic diagnosis revealed GBM. The patient recovered well from surgery and decided to discontinue any further treatment. MRI of the head performed 4 months after surgery showed mild postoperative changes based on the information from his local physician. One year following surgery, the patient was doing very well, and his MRI showed no tumor recurrence. Since this time, follow-up MRIs have indicated no tumor recurrence. The last MRI of the head performed in July 2011, revealed no signs of tumor recurrence. The patient is approaching a survival of 19 years since the start of ANP treatment, and maintains a very good quality of life. His OS is over 18 years and PFS over 18 years (from second tumor resection). In this case, the patient accomplished partial response (PR) on ANP, but obtained long-term PFS after the second resection. It is worth noting that recurrent GBM usually relapses after total resection in absence of effective treatment. A 53-year-old Caucasian male presented to BC with fatigue, loss of left peripheral vision and occasional epileptic seizures. He was in good health until October 2011 when he developed seizures. He was taken to the emergency room and the MRI revealed a mass in the right parietal area. A biopsy of the mass revealed grade 3 oligoastrocytoma and gliomatosis (Table 2). Figure 3. Patient 3. (A) Baseline MRI of the head with contrast; (B) Follow-up MRI of the head with contrast indicating partial response; (C) Follow-up MRI of the head indicating complete response. Table 2. Characteristics of patients treated with sodium phenylbutyrate in combination with targeted agents. Abbreviations: AA—anaplastic astrocytoma; BVZ—bevacizumab; BC—Burzynski Clinic; CR—complete response; GBM—glioblastoma multiforme; MRI—magnetic resonance imaging; M—male, OS—overall survival; PET—positron emission tomography; PFS—progression-free survival; RT—radiation therapy; PB—sodium phenylbutyrate; TMZ—temozolomide; PBC—sodium phenylbutyrate combination. In November 2011 he underwent subtotal tumor resection at a University Hospital. His tumor measured 8 × 5.5 cm and involved the right temporal, occipital and parietal lobes and corpus callosum. The pathology diagnosis confirmed GBM. From December 2011 to the end of January 2012, he underwent 30 treatments of standard RT in conjunction with TMZ, 140 mg for five days every 4 weeks. Two weeks from the completion of RT, he developed recurrence and underwent a second resection. Six weeks later he began treatment at BC with PB, BVZ, erlotinib, rapamycin, and TMZ. He received 6 cycles of TMZ, 8 cycles of BVZ, and 17 months of erlotinib and rapamycin. His treatment plan was designed with the assistance of molecular profiling. Standard doses of these drugs were used, except rapamycin, which was given at 0.01 mg/kg/d and PB at 0.15 mg/kg/d (discontinued in June 2014). After one year, there was a 50% reduction in the dose of erlotinib. The baseline MRI revealed a 5.2 × 4.3 cm recurrent tumor which was no longer visible after six weeks of treatment (Figure 4). The follow-up MRIs at quarterly intervals and PET/CT scans did not show tumor recurrence (last MRI June 2014). The treatment was associated with minor adverse events including grade 2 skin rash and diarrhea, which resolved after a dosage modification. The patient is surviving in excellent condition and his overall survival and progression-free survival is currently over two years. Figure 4. Patient 4. 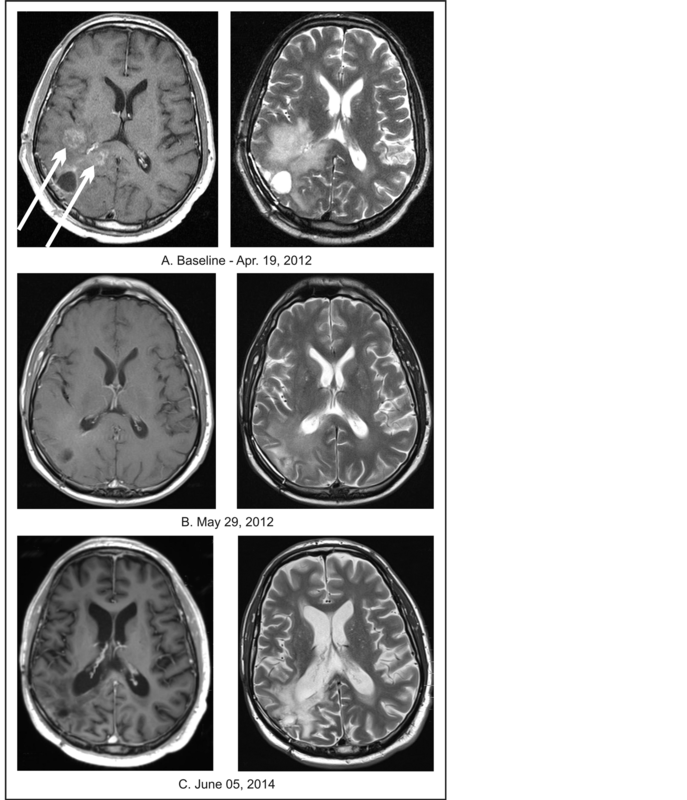 (A) Baseline MRIs of the head with contrast (left column) and T2 weighted MRI without contrast (right column); (B) Follow-up MRIs of the head indicating complete response; (C) Follow-up MRIs of the head indicating continuation of complete response. placed by dasatinib (at a 50% dosage reduction vs. the standard dose). The treatment with TMZ, pazopanib, and everolimus continued for one year and with dasatinib for eleven months. PB continued for 14 months. Additional drugs included moxifloxacin for five days, and p.r.n. use of diazepam and ondansetron. Upon admission, the patient complained of occasional vertigo, cough, a slight fever and had a history of epileptic seizures. His neurological examination was within normal limits and his KPS was 90. A year after completion of treatment, his physical examination was within normal limits and he didn’t have any neurologic complaints. A follow-up MRI after 6 weeks of treatment revealed complete resolution of the tumor, which was confirmed by periodical MRIs at 2-month intervals for the next 8 months, a PET/CT at 8 months and an additional MRI (July 2014) after 1 year and 5 months from treatment onset (Figure 5). His treatment was very well tolerated and was associated with minor toxicities, including weakness and skin rash. Skin toxicity was no longer present after discontinuation of erlotinib. Numerous chemotherapy and targeted therapy regimens have been evaluated for the treatment of patients with recurrent GBM   . Some studies provided minor improvement in PFS, but no significant increase in survival   . Thus, successful therapy for recurrent GBM is still desperately needed    . The authors of this article suggest that such treatment is currently an option and consists of a combination of targeted prescription drugs. It is not our intention to state that the efficacy of such therapy has been proven, but to invite experts in the field to participate in new clinical studies that can validate this hypothesis. We cannot yet present the results of such trials, but we would like to support this hypothesis based on the results of a Phase II trial with ANP and our experience with the combination of targeted agents in the setting of private practice. This is not a standard way to present data to the scientific community, but a paucity of therapies for recurrent GBM requires unusual measures. The history of science teaches us that sometimes the successful treatment of even a single case of incurable brain disease may trigger a paradigm shift  . According to James Watson, science sometimes needs to be ambitious, ruthless, and passionate  . In Phase II studies of ANP and GBM, we identified a small group of patients with unusually long overall survival. We describe three such cases with OS from 9 to 18 years. Case studies of Patient 1, 2, and 3 provide evidence that it is possible to have successful treatment for recurrent GBM with a combination of two investigational agents, A10 and AS2-1. In two cases with RGBM, long-term PFS was accomplished with ANP treatment. In a third case, the patient had PR as the result of ANP therapy, but the combination with surgical resection resulted in an unusually long PFS. This suggests an additional possible effective therapy for relapsed GBM–ANP treatment until PR, followed by surgical resection. Phase II study of ANP in ERGBM indicated 17% of OR and increased OS compared to other studies  . Unfortunately, only a small percentage of patients obtained long-term OS (Table 3). Figure 5. Patient 5. (A) Baseline MRI of the head with contrast; (B) Follow-up MRI of the head with contrast indicating complete response; (C) Follow-up MRI of the head with contrast indicating continuation of complete response. Table 3. Clinical studies in recurrent or progressive GBM with targeted agents. Abbreviations: ANP—antineoplastons A10 and AS2-1; BVZ—bevacizumab; CR—complete response; ERGBM—eligible recurrent glioblastoma multiforme; GBM—glioblastoma multiforme; OS—overall survival; PR—partial response; PFS—progression-free survival; RGBM—recurrent glioblastoma multiforme; SD—stable disease; TMZ—temozolomide. *BVZ group only. longer available. Such treatment is illustrated in case studies 4 and 5. The treatment plan for these patients included TMZ and three to four targeted agents. As described in the case studies, there was a reduction in dosage for the targeted agents in order to avoid combined toxicity of the drugs. On the other hand, the treatment explored synergistic effect of the drugs, which permitted the dose reduction. Patient 5 refused TMZ before, and this is the reason why we combined TMZ with other drugs in his case. Patient 4 used TMZ only for a short time. It was expected that in his case he may still have benefited from TMZ due to a prior short course of treatment. The treatment accomplished rapid CR in both cases with OS in excess of 2 and 1 year respectively. The adverse events were easily manageable. Currently, the patients are off treatment and live a normal life. However, it is unknown to us if their OS will continue to last. The evidence to support longer than two year OS for recurrent GBM does not exist for PB or for other agents in cases of recurrent GBM. It is possible that these patients may still need treatment with ANP, which provides higher doses than PB. Long-term survival has been described in the past in a small percentage of patients with GBM, but the authors are not aware of well-documented cases in the medical literature with OS in excess of 15 years for recurrent GBM (patient 1 and 3). The pathology and responses of all five cases described in this article were confirmed by outside experts. Important details are provided in Table 1 and Table 2 to support the diagnoses and responses. A pivotal study organized by the European Organization for Research and Treatment of Cancer and the National Cancer Institute of Canada Clinical Trials Group in patients with newly-diagnosed GBM provided the rationale for the current standard-of-care   . Since 2005, the standard-of-care consists of tumor resection followed by standard RT with concomitant TMZ (75 mg/m2/d) for seven weeks and adjuvant TMZ (150 - 200 mg/m2/d) on 5 day therapy every 28 days. Based on these recommendations, apatient may expect a median OS of 14.9 months or a median PFS of 6.7 months. However, the recurrence rate is over 90%, median OS is less than 18 months, and survival at 5 years is less than 2% of patients   . Unfortunately there are no effective treatments for RGBM    . Clinical studies on RGBM with chemotherapy and targeted therapy were recently compiled in excellent reviews   . There has been only very modest progress in treatment of GBM and specifically there are no current standard recommendations for RGBM. We summarize in Table 3, results of selected clinical studies with BVZ, erlotinib, pazopanib, vorinostat and dasatinib used as single drugs or in combination with other targeted agents and chemotherapy. The studies report PFS at 6 months between 0% and 42.6% and the median OS between 2.5 to 10.5 months. The additional studies of phenylacetate and PB did not separate GBM from other types of brain tumors for evaluation of response and survival   . Detailed information can be found in the excellent review of Olson et al, which identified 232 publications of potential relevance  . The studies do not provide evidence to recommend any of these regimens to support the use of single or two targeted agents with or without chemotherapy for the treatment of RGBM  . Based on basic research on ANP and PB and our experience on Phase II studies with ANP and in private practice with PB, we propose a treatment plan for the upcoming Phase I/II clinical studies with ANP and PB in combination with targeted agents  . This treatment plan address basic biological mechanisms in GBM such as the control of growth, survival, invasion and migration of neoplastic cells, vascular effects, metabolism, maintenance and function of neoplastic stem cells, main signaling pathways, cell cycle mechanisms, apoptosis, autophagy, and drug resistance. The medications proposed regulate vascular endothelial growth factor (VEGF) signaling: BVZ, pazopanib, or sorafenib, Rous sarcoma inducing oncogene (Src) kinases (dasatinib), mammalian target of rapamycin (m-TOR) pathway (everolimus or sirolimus), and affect multiple targets of ANP and PB. It is important to realize that the activity of BVZ is not limited to angiogenesis and vascular permeability, but also effects microenvironment immune cells and through autocrine and paracrine mechanisms, influences the functions of neoplastic stem cells  . Downstream signaling is mediated by receptor tyrosine kinases (RTKs) and neuropilins (NRPs)  . Through NRPs, VEGF signaling affects signaling pathways and multiple intracellular targets and RTKs  - . The effect of BVZ is primarily mediated through VEGF receptor 2 (VEGFR2). NRPs are receptors for Class 3 semaphorins after they form complexes with specific plexins in normal and neoplastic cells  . NRPs play a double role of semaphorins and VEGF receptors and they are exposed on neoplastic cells  . The complexes of NRPs with VEGFR RTKs increase the effectivity of these receptors for VEGF  . NRPs play important part in activation and trafficking of VEGFRs and other growth factor receptors  . The transcription of NRP2 is induced through JUN N-terminal kinase (JNK), which is activated after the loss of phosphatase and tensin homolog (PTEN)  . In response to VEGF stimulation, VEGFR2 regulates metastasis oncogene (MET) signaling, which plays a very important part in GBM  . NRP 1 and 2 interact with a number of growth factor receptors including epidermal growth factor receptor (EGFR), transforming growth factor (TGF)α, TGFβ, fibroblast growth factor (FGF)2 and platelet-derived growth factor (PDGF)  -  . There is an increase of integrin signaling through VEGFR as well as signal transduction through phosphatidylinositol-3-kinase (PI3K)/AKT pathway  . BVZ blocks VEGF interaction with its receptor, but does not affect the activity of NRP  . Autocrine/VEGF signaling increase signal transduction through PI3K/AKT/ mitogen-activated protein kinase (MAPK) pathway and promotes neoplastic growth and invasion   . VEGF may also play a part in therapy resistance, since NRP2 and VEGFC signaling affects m-TOR complex 1, which activates autophagy  . The maintenance of neoplastic stem cells is supported by autocrine VEGF signaling and VEGF-NRP2 mediated activation of integrins and hedgehog signaling  - . TRK inhibitors, pazopanib or sorafenib, block intracellular signaling of VEGFR2 and MET and affect the maintenance of neoplastic stem cells  . The treatment of GBM with BVZ, pazopanib or sorafenib, dasatinib or erlotinib, ANP and PB inhibits promotion of growth and survival, invasion, and migration of the GBM cells (Figure 6). The angiogenesis and increased vascular permeability is reduced by BVZ, pazopanib (sorafenib), and ANP   . As the result, there is a decrease of tumor size and improved penetration of the tumor structure by the medications. ANP has high osmolality which improves penetration of the tumor by the additional drugs. ANP and PB regulate important cell cycle checkpoints G1/S and G2/M (Figure 6)  . Pathway inhibition has been proposed by leading neuro-oncologists as a possible mechanism for anti-GBM therapy  (Figure 7). Figure 6. Inhibition of growth, survival, invasion, angiogenesis, and cell cycle of GBM cells by ANP/PB in combination with targeted agents. Abbreviations: VEGF—vascular endothelial growth factor, VEGFR2—vascular endothelial growth factor receptor 2, NRP—neuropilin, JUN—oncogene, PI3K—phosphoinositide 3-kinase, EGFR—epidermal growth factor receptor, PDGFR—platelet-derived growth factor, MET—metastatic oncogene, ANP—antineoplastons A10 and AS2-1, PB —phenylbutyrate, BRAF—v-raf murine sarcoma viral oncogene homolog B, CDK—cyclin dependent kinase, CCN—cyclin, CDC—cell division cycle phosphatase, CHK—check point kinase, Dp1—transcription factor Dp1, E2F—regulatory protein E2F, HDAC5—histone deacetylase, MCM—minichromosome maintenance protein, ORC—origin recognition complex, PCNA, PLK—polo-like kinase, RAS—oncogene; p21, TP53, GADD45A—tumor suppressor genes. Figure 7. Inhibition of signaling pathways, metabolism, drug resistance, cell cycle maintenance, and promotion of apoptosis in GBM cells by ANP/PB in combination with targeted agents. Abbreviations: PDH1, DLD, PDP2, ACO2, IDH3A/3B, IDH2, DLST, OGDH, SUCLG1/2, PH, MDH1-TCA cycle genes; BRAF, RAS, ERK, DDC, MAP4K, JUN, AKT2, mTORC1 —oncogenes; p27, TP53, BAX, PTEN, DUSP, PTPRR, TXNIP, VDUP—tumor suppressor genes; BCL-2—antiapoptotic gene; HDAC—histone deacetylase; VEGF—vascular endothelial factor; NRP—neuropilins; ANP—antineoplastons PB— phenylbutyrate; PI3K—phosphoinositide 3-kinase. ANP and PB inhibit RAS/MAPK extracellular signal-regulated kinase (ERK), JUN/p38/MAPK and PI3K/ AKT/PTEN pathways  . A combination of everolimus or sirolimus with ANP or PB decreases metabolism in GBM cells (Figure 7). ANP and PB bind glutamine, the main source of energy (together with glucose) for GBM cells   . The final goal of anticancer treatment is apoptosis and prevention of recurrence (drug resistance), which is supported by ANP/PB, BVZ, pazopanib (sorafenib), and everolimus (sirolimus)  . The crucial mechanism for long-term OS is reduction and elimination of neoplastic stem cells, which is supported by BVZ, pazopanib (sorafenib), ANP and PB  - . The authors propose new Phase I/II clinical trials with ANP or PB in combination with targeted agents, BVZ, pazopanib, dasatinib and everolimus in patients with RGBM after failure of standard surgery, RT and TMZ and/ or BVZ to be conducted to evaluate survival, response and toxicity in this group of patients. Molecular profiling on tumor tissue will be performed to identify “genomic signatures” of responders and non-responders. Based on the experience from private practice of authors, some patients may not tolerate the proposed combination. Such patients may still be helped by the substitution of pazopanib with sorafenib, which has similar a spectrum. Erlotinib or lapatinib can be used in cases with specific genomic targets for these drugs. There is no established standard of care for RGBM. Numerous clinical studies with single chemotherapy and targeted agents or their combinations have shown some promising results, but the progress has been very modest. The treatment with PB in combination with targeted agents carries a lot of promise for a rapid and durable response in RGBM. The results reported in this paper provide evidence that it is possible to accomplish long-term OS in RGBM with ANP or with PB in combination with targeted agents and chemotherapy. 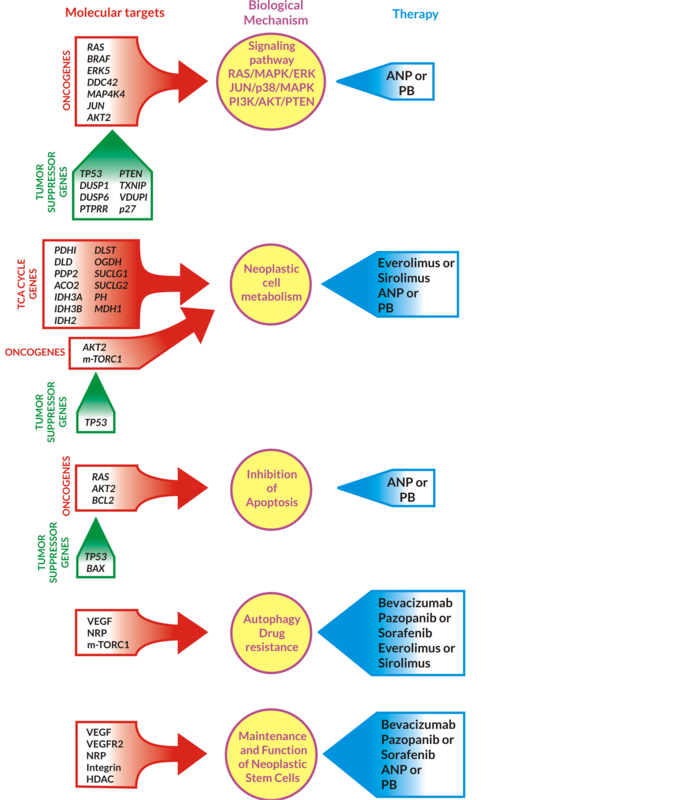 The authors propose Phase I/II clinical trials with ANP or PB in combination with targeted agents: BVZ, pazopanib, dasatinib and everolimus for patients with RGBM after failure of standard surgery, RT and TMZ and/or BVZ. Caution should be exercised when combining these agents, since no clinical trials have yet been conducted with such combinations. With proper dose reduction, such treatment appears to be reasonably well-tolerated. Molecular profiling will help to select subgroups of RGBM with favorable genome signature for future studies. Written informed consent was obtained from patients for publication of this case report and accompanying images. All authors are employed by Burzynski Clinic. Dr. Stanislaw R. Burzynski and Dr. Gregory S. Burzynski are shareholders and directors, and Dr. Tomasz J. Janicki is the Vice-President of Burzynski Research Institute, Inc. Dr. Stanislaw R. Burzynski is President of Burzynski Research Institute, Inc. and Dr. Gregory S. Burzynski is Vice-President of Burzynski Clinic. The authors express their appreciation to the additional physicians involved in the care of the patients: Drs. Alejandro Marquis, Ania Marszalek, Sheryll Acelar, Barbara Szymkowski, Lourdes De Leon, Mohammad Khan, and Eva Kubove; and Carolyn Powers, Maria Corzo, and Adam Golunski involved in the preparation of the manuscript. 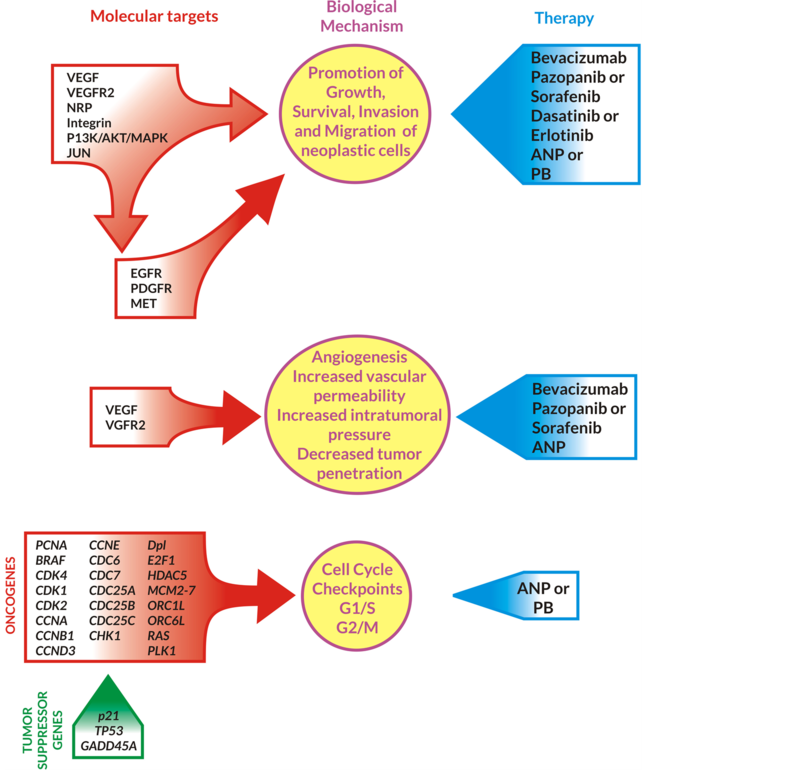 Ohka, F. Natsume, A. and Wakabayashi, T. (2012) Current Trends in Targeted Therapies for Glioblastoma Multiforme. Neurology Research International, 2012, Article ID: 878425. Burzynski, S.R. (1988) Antineoplastons: Basic Research and Clinical Applications. Advances in Experimental and Clinical Chemotherapies, 6, 1-7. Burzynski, S.R., Janicki, T.J. and Burzynski, G.S. (2014) A Phase II Study of Antineoplastons A10 and AS2-1 in Adult Patients with Recurrent Glioblastoma Multiforme. Final Report (Protocol BT-21). Journal of Cancer Therapy, in press. Burzynski, S.R., Janicki, T.J., Burzynski, G.S. and Marszalek, A. (2014) A Phase II Study of Antineoplastons A10 and AS2-1 in Children with Recurrent, Refractory or Progressive Primary Brain Tumors. Final Report (Protocol BT-22). Journal of Cancer Therapy, in press. Burzynski, S.R. and Patil, S. (2014) The Effect of Antineoplastons A10 and AS2-1 and Metabolites of Sodium Phenylbutyrate on Gene Expression in Glioblastoma Multiforme. Journal of Cancer Therapy, in press. Geison, L. (1995) The Private Science of Louis Pasteur. Princeton University Press, Princeton. Sathornsumetee, S., Desjardins, A., Vredenburgh, J.J., McLendon, R.E., Marcello, J., Herndon, J.E., et al. (2010) Phase II Trial of Bevacizumab and Erlotinib in Patients with Recurrent Malignant Glioma. Neuro-Oncology, 12, 1300-1310. Chang, S.M., Kuhn, J.G., Robins, H.I., Schold, S.C., Spence, A.M., Berger, M.S., et al. (1999) Phase II Study of Phenylacetate in Patients with Recurrent Malignant Glioma: A North American Brain Tumor Consortium Report. Journal of Neuro-Oncology, 17, 984-990. Prud’homme, G.J. and Glinka Y. (2012) Neuropilins Are Multifunctional Coreceptors Involved in Tumor Initiation, Growth, Metastasis and Immunity. Oncotarget, 3, 921-939. Byzova, T.V., Goldman, C.K., Pampori, N., Thomas, K.A., Bett, A., Shattil, S.J., et al. (2000) A Mechanism for Modulation of Cellular Responses to VEGF: Activation of the Integrins. Molecular Cell, 6, 851-860.